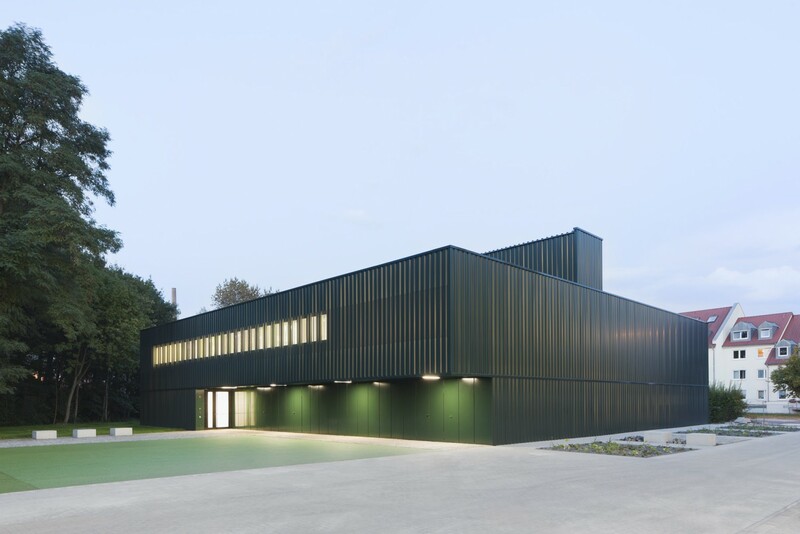 The gymnasium at the Franz-Mehring-Schule replaced the previous building that was structurally very obsolete. The narrow financial means from the Konjunkturpaket II economic stimulus package were used to create a compact building that generates a new identification point on the heterogeneous school grounds through precise design elements. The single-field hall reflects the compacted parameters of the construction task: the largest possible space allocation plan, minimal open space consumption and high energy requirements. The structure encompasses the open areas of the school and protects them from the nearby Kommandant-Prendel-Allee avenue. A central open area with the quality of a schoolyard was created between the school, school expansion, gymnasium and existing tree population. 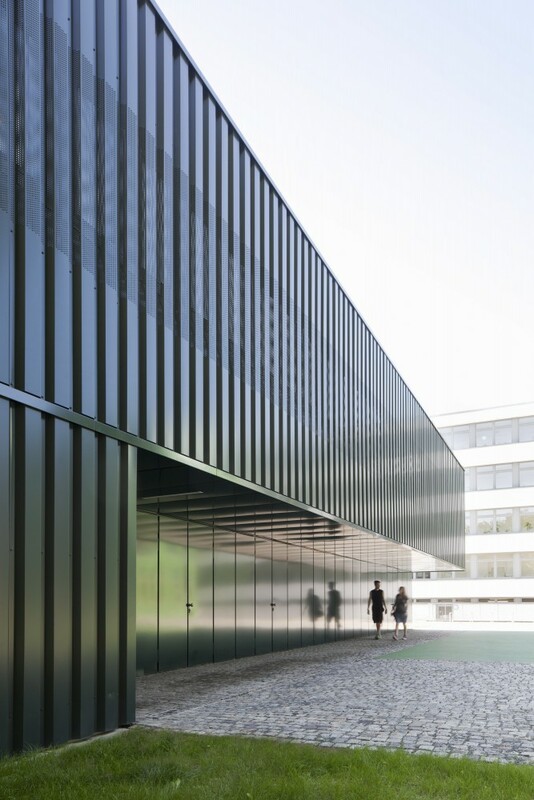 The design of the building envelope was concentrated on the effect of the space and the interplay of colours resulting from the dark green metal facade and the surrounding existing tree population. An important element is the large undercut in the building volume forming the entrance area of the gymnasium and clearly points in the direction of the schoolyard. This creates a protected covered area that provides space for communication (during breaks) and is a welcome meeting point for physical education classes and sports clubs. 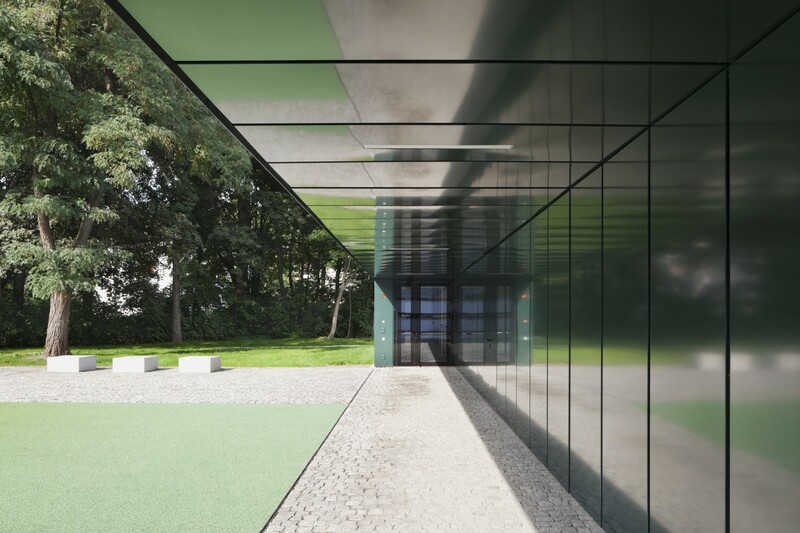 The gymnasium’s white interior flooded with light forms a strong contrast to the green metal facade. The gallery serves as a central junction point and functional centre for gymnasium use; it connections the changing rooms for teachers and students with the gymnasium area. 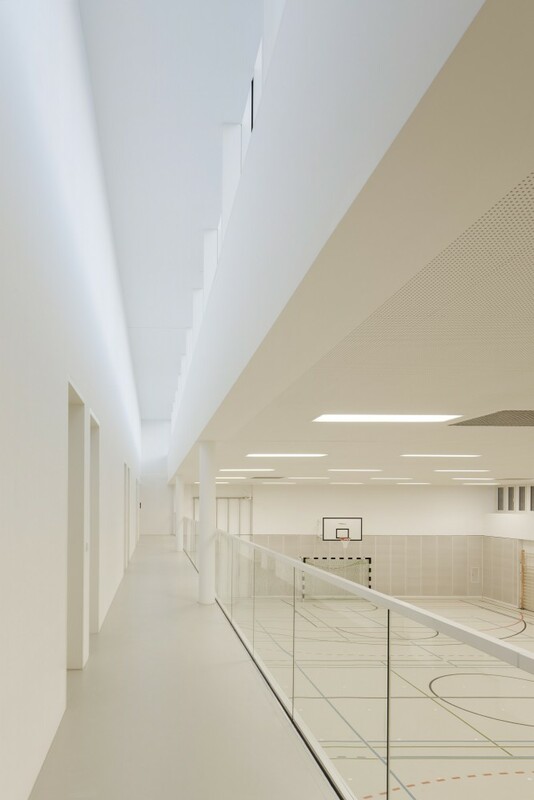 The large skylights above the gallery directs sunlight into the interior areas of the gymnasium and enables even light distribution together with the ribbon windows located behind the perforations in the metal facade. 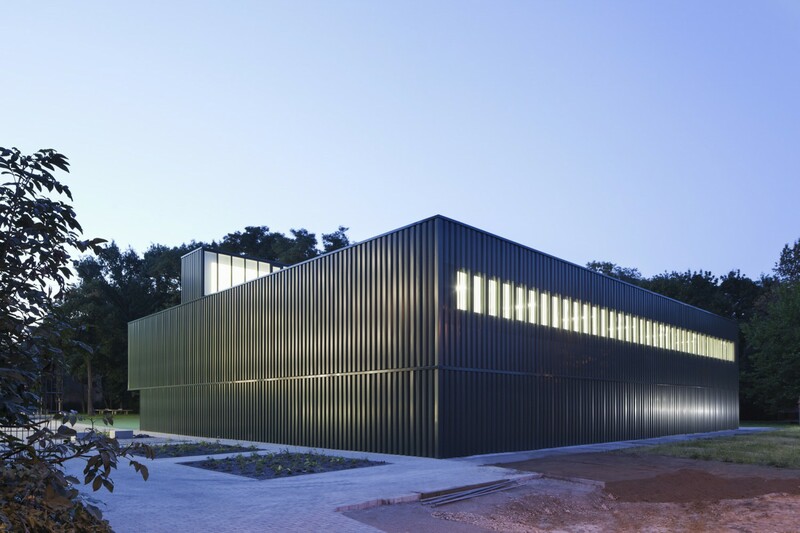 The aluminium sheet curtain facade was realized as a rear-ventilated and insulated multi-leaf construction in front of a solid exterior wall made of reinforced concrete. The combination of passive house components and the compact building volume cause the building to consume 30 percent less energy than the standards of ENEV 2009 (Energy Saving Ordinance 2009).